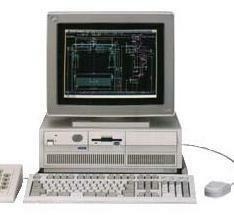 5560-W, the first desktop model with 486 class CPU, was introduced to the market on Oct. 1990 together with 5580-Y. complexes are different from 8590 and 9590. Main differences are as follows. 5560 doesn't use memory riser card. Two MCA BUS slots are prepared in stead of memory riser connector. XGA video is not ready on the planar. Power connectors are not Edge Card type. All types of 5560 use same planar. J11 & J12 are not for SIMM risers but they are usual 32-bit MCA slots. 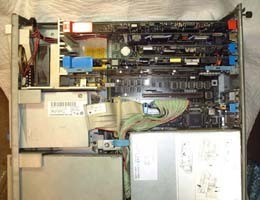 SCSI /A with cache is initially installed at J12. Japanese Display Adapter B-II ( or XGA-2 ) is placed at J7. female connectors from PSU are plugged. As described in At a glance page, there are 4 types of 5560. 5561-W1x ; 486SX25 Memory count is faster than -W0x. 5561-W2x ; 486DX2-50 Most likely the complex is same with -W1x. 5561-Nxx ; 486DX2-66 Supper charged 5560 with a Type-B DX2-66 upgrade platform. VRAM 1MB ( PS/55 Display Adapter ) B-2 ? *2 NMB : MCADAM/2 ( CAD software ) included . ASYNC TTL /Adapter is included. 8 x 72pin SIMM sockets are directly mounted on the planar. True parity 8MB/70ns SIMMs are mandatory for -W1, -W2 and -N complex. For W0 complex, 80ns SIMMs are standard and must be used in matched pair. For W0/W1 models, reference Ver. 1.11 is required to use RAM's more than 16MB. No video chip is ready on the planar. PS/55 Display Adapter B-2 ( BVE with VGA chip ) is used for 5560. 5560 doesn't have XGA chip on the planar. AVE 32-bit slot locates beside complex riser in addition to BVE slot which is already occupied with D/A B-2. A stock SCSI /A for -W1/W2 models is, unlike 8590, half length 32 bit adapter with AT like 50 pin header . ADF is usual @8eff ( 32Bit with cache ). SCSI micro code set is 64F4376/4377. See outline HERE. 16 bit SCSI /A was used for W0 model but I don't know if it was a long uncached card or short uncached card. Photos below are inner view of my 5561-W1B with Type-B Upgrade processor complex. 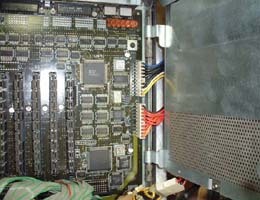 Half sized caching SCSI /32A with 50 pin header was changed to a short caching SCSI /A -II/32A with new micro code set. speed ( No CPU fan but fresh air blows out from the front fan ). right side like Mod. 95. Tall height SIMMs are not good for 5560. Needs clearance between SIMM and the PUS. Following complexes can only be used with 5560 planar except W0 complex which can be used for 5580 if you want. W0 ; P/N 79F0087, 80486DX-25MHz. Seemed to be a Modified Type 1- J. 256K cache card available. No overdrive socket prepared. This complex can take 31 MHz OSC without any change of BIOS. The Board design is same with 5580-Y complex. BIOS P/N are same each other but just the board P/N and FUR and OSC are different ( 5580-Y0 uses 33.3MHz OSC ). W1 ; P/N 07G0460 FUR 95F4299, 80486SX-25MHz. placed right next to the main socket. Memory count is faster than W0 complex. My machine is labeled as "5561-W1B" and has a sticker "KIT-W2B". 80486DX socket) where P/N is silk screened on a W1 complex. Also there is a " MPU Upgrade" sticker attached on the blue lock lever of the complex board. the socket U9. W1 and W2 complexes are "same" each other. at U6/GA-M. If U6/GA-M is 10G7808 a Turbochip should work fine. I9990044, 605 FDD errors, permanent 165 errors and inability to read from FDD). " 1). DX4ODP-75 with 486SX25 on the 1st socket. 3). DX4-100 on an interposer with VRM alone on the 2nd socket. 4). am5x86 or Cyrix 5x86 ( with voltage interposer )on the 2nd socket. complex. The board P/N ( or FRU ? ) and the BIOS P/N are just different. A variant of Type 2- L? No support for SyncroStreaming Data transfer. Originally equipped in Model 556-N which was introduced to the market in Sep.1992. The complex is also referred as DX2-66 UpgradeType-B . N complex has solder pads. DMA controller chip U6 is 34G3517 for N and 92F1428 for W1/2. All complexes of model 5560 including N complex use EPROM. Streaming data transfer feature is not supported on all 5561 complexes. For Wxx, DX4ODP-75 can be used. You can use DX4ODP-100 but it runs in 75MHz inner speed. will get fresh air flow from the front fan. 60-W2 can be replaced to -N complex. in this case. REF/DIAG for 5580-Wxx should be used together with. 5580 with 60-W0 complex with 5580-Y REF/DIAG ==> No equivalent model exist but works fine. Hitachi made x2 CD-ROM without bezel.